20 lakes and 26 acres of lush preserve. card room, and fitness facility. The Community consists of three Neighborhoods; 350 single-family homes in Oak Hollow & Mahogany Run; 110 single-family attached villas in Maple Brooke; and 88 condominium units consisting of 22 two-story buildings in Cedar Ridge. Built as a family-friendly community, our children attend Seagate Elementary, Pine Ridge Middle and Barron Collier High schools. Our amenities include two swimming pools, heated spa, tennis courts, basketball court, playground, fitness room and two meeting/activity rooms. We are fortunate to have twenty beautiful lakes and 26.5 acres of natural preserves for peaceful walking. Autumn Woods is located only 2 miles from the Gulf of Mexico with upscale shopping and dining less than 2 miles. To Schedule an Irrigation System Wet Check - Owners and/or Irrigation Companies will need to call the property manager, (596-9634) or fax a request to (596-9716) before Wednesday at 1:00 pm to schedule wet check. The wet check time is 8 a.m. to noon on Thursday and the First Saturday of each month. All Irrigation Companies must be licensed and insured. Wet checks are not an additional watering day. Water is to be on during a scheduled wet check only with the owner or owner's repair technician present and then promptly off please. All residents will need to submit a written request to the Property Manager regarding irrigation water for NEW sod installed between July 1st and September 30. Irrigation will be available for 1½ hours a day and for 4 consecutive days. The owner will be advised of the additional irrigation time and will be responsible for setting their irrigation clock at the assigned time. No irrigation for new sod will be provided from October 1st through June 31st. Note that all times are Eastern Standard Time. During Daylight Savings Time, your clock needs to remain set at Eastern Standard Time. **** It is critical that everyone irrigate only at their designated times. We are asking all residents in the community to be diligent about repairing broken sprinkler heads and other malfunctions of their home systems in order to protect our precious water supply. Thank you for your efforts in helping us in conserve and use water wisely. If you have any questions, please contact, Tony McHugh, Property Manager. Autumn Woods Community Association, Inc.
Bermad 1 Common Areas along Goodlette Frank Rd. Bermad 8 6529 - 6537 and 6541 - 6621 Autumn Woods Blvd. Bermad 9 6468-6536 and 6469-6525 Autumn Woods Blvd. Bermad 10 6416 - 6465 Autumn Woods Blvd. Lakes Restoration will begin November 30, 2015, with the two northernmost lakes. Lake 16 and Lake 15 are detailed on the diagram below. We thank you for your patience as this long awaited project proceeds through the next nine months. See notice here. This is the first award of its kind to be presented in the State of Florida. Special thanks to Sandy Johnson and all the volunteers who put in their hard work for a Great Achievement! Pickleball: Tuesdays 8:30am, Thursdays 7:00pm, and Fridays 8:30am. Meet at the tennis courts. 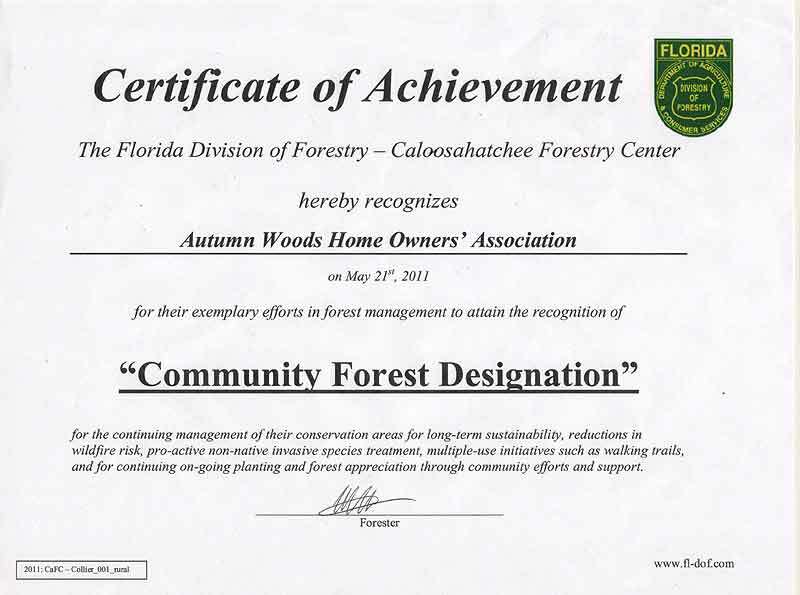 Activities on this page are organized by volunteer homeowners and are not sponsored or organized by any Autumn Woods Board. Do You Need a New Mailbox? Lykins Signtek offers preferred pricing to Autumn Woods Residents to replace or refurbish your mailbox and posts. Share a mailbox post with a neighbor? Split the cost.